Are you really a person if you’ve never watched “Home Alone”? Up for debate. “Home Alone” was iconic for a lot of kids growing up in the 90s, setting the bar pretty high for what could happen if you were left to your own devices. Here are seven life lessons we can learn from watching the classic film. 1. Come prepared with a well-thought-out plan. 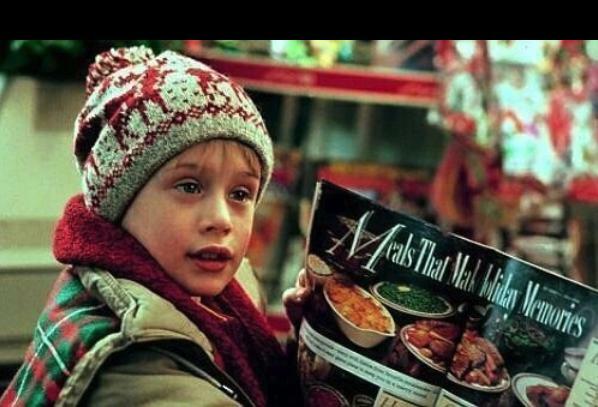 If there’s anyone who taught 90s kids how effective it can be to have a well thought out plan it was Kevin McCallister. Somehow, the eight-year-old came up with a master plan to stop high-profile criminals and in the end, he successfully defeats them. This shows us that at any age, a thorough plan of attack makes all of the difference, whether it’s getting all of your work done in time or navigating a foreign country by yourself. 2. Always make time for a good meal. Life can get a little hectic, but we should always make time for a good meal. Even if you’re eating alone at the dinner table with a big bowl of mac and cheese like Kevin, eating is a time to collect yourself and be in the moment. We live in a chaotic world where we rarely get to escape even our own thoughts because of technology. If you can make the time — it can be as little as 15 or 20 minutes — to just sit and eat with no distractions, it’ll calm you down, without a doubt. 3. Don’t believe rumors — see for yourself. In the movie, there’s a rumor that Kevin’s neighbor, known as “Old Man Marley,” murdered his whole family with a snow shovel, according to Kevin’s older brother Buzz. When Kevin is abandoned by his family he ends up making friends with Old Man Marley and learns he’s actually just a nice old man with a story. This goes to show you that you should never believe rumors. Investigate things for yourself before you make assumptions. More often than not people can surprise you. 4. You’ll find the nicest people in the most unexpected places. When Kevin’s mom is frantically trying to get back to see her son in time for Christmas, she has some bad luck at the airport. Just when she least expects it, Gus Polinksi, known as the “Polka King of the Midwest,” offers to give her a ride back home. The mom was a little skeptical at first, but Gus and his polka crew were the nicest people. You should always keep an open mind when it comes to meeting new people. Go with your gut instinct, but also remember to give people a chance before you default to saying no. 5. Family is the most important thing. Kevin might’ve wished for a life without his family when they were getting on his nerves, but a few days without them, he realized how important they were to him. Even in the midst of chaos, family or friends will be there to support you. Try not to be like Kevin’s mom and get so swept up in vacation plans that you forget your kid. 6. Keep calm, cool and collected. Even though Kevin has been left home alone by his entire family, he manages to keep his cool. He attempts to shave, eats his mac and cheese, goes to Church, goes grocery shopping, eats junk food, watches TV and orders a pizza. Whenever you’re in a stressful situation, the best way to react is usually to try and stay calm, cool and collected. You’re not going to get anything done when you’re freaking out. One of the biggest themes we can take away from “Home Alone” is that communication is key. If any single person in the house had communicated that Kevin was missing, they wouldn’t have been in that mess in the first place. Communication is crucial, but it’s easier said than done. Without communication, it’s hard to have anything go smoothly. Even if you’re caught up in the moment, try and find a way to express your thoughts clearly to those around you. It’ll seem like a lot of effort in the moment, but it’s usually worth it.